Thank you for your support of T2019: The 22nd International Council on Alcohol, Drugs and Traffic Safety (ICADTS) Conference. World experts will gather in Edmonton, Alberta, Canada in August 2019 to bring together the latest research, technology and practice relating to alcohol, drugs and traffic safety. As a critical global conference held every three years, T2019 offers all orders of government, business and academic institutions an opportunity to showcase their latest prevention initiatives, technology and leading or best practices in alcohol, drugs and traffic safety. Coming almost one year after the legalization of cannabis in Canada, sponsorship of the conference will provide access to global experts with an interest in the legalization of this drug, its effects on traffic safety, and the use of other legal and illegal drugs and alcohol. Meet the next generation of young researchers and explore the interest of other countries developing their legislation, technology and research. As a Platinum, Gold, Silver or Bronze Sponsor, your organization is entitled to receive one complimentary exhibit booth for the trade show. You have the option to purchase additional booths below. Additional booths can be purchased for $1,750.00 each. GST will be charged on all exhibitor booth purchases. One table, two chairs, and standard pipe and drape. One exhibitor name badge for an individual working at the booth, which provides access to all conference sessions and activities including the Sunday evening welcome reception and Tuesday conference dinner. Materials storage, customs brokerage and/or material handling fees. Upgraded furniture, display materials and additional service options, which are available for purchase from the official show services provider. Booths can be purchased for $1,750.00 each. GST will be charged on all exhibitor booth purchases. Booth space allocations will be accepted on a first come, first-served basis, with priority given to the Platinum Sponsor. The trade show organizers reserve the right to allocate exhibit space but every effort will be made to accommodate your company's request. As a Platinum Sponsor, your organization is entitled to be the exclusive sponsor of our Conference Guide cover as well as a full page ad. You have the option to purchase additional advertising below. As a Gold Sponsor, your organization is entitled to a full page ad in our Conference Guide. You have the option to purchase additional advertising below. 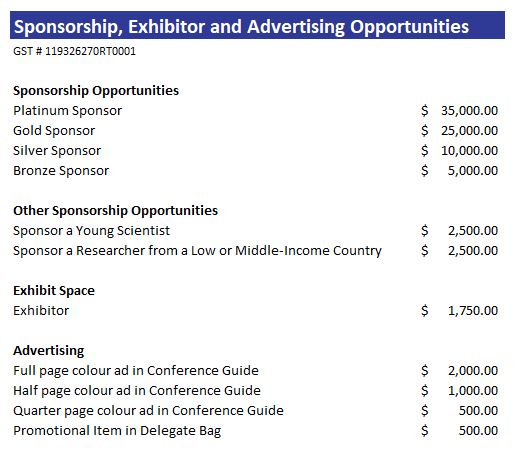 As a Silver Sponsor, your organization is entitled to a half page ad in our Conference Guide. You have the option to purchase additional advertising below. As a Bronze Sponsor, your organization is entitled to a half page ad in our Conference Guide. You have the option to purchase additional advertising below. Additional advertising can be purchased beyond your included benefits. Each individual application must use a unique email address below. There is the option to include a "cc" address, which can be used multiple times. Ms. Mr. Mrs. Miss Dr. Prof. Please upload your organization's logo for use on the website. We will be in touch to arrange transfer of a high-resolution image for print use. Uploaded image files must not exceed 1 MB, but may be emailed after completing this form. All registrations which include sponsorship will be required to submit payment by cheque only. An invoice will be emailed to you with your registration confirmation. You will be prompted to enter card details after submitting this form. Once your form is submitted, you will receive a confirmation email as well as an invoice. The invoice should be submitted to your finance department for payment.